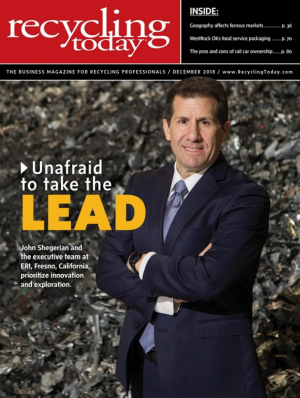 ERI, the nation’s leading recycler of electronic waste and the world’s largest cybersecurity-focused hardware destruction company, has announced that it has become the recycling industry’s first adopter of Basel Action Network’s (BAN’s) innovative new EarthEye tracking system. EarthEye offers real-time logistics monitoring to government agencies and businesses concerned about the possibility of data-security breaches from the theft of data from discarded equipment; unauthorized exports to substandard recycling operations in developing countries; and brand damage from lack of accountability and downstream due-diligence. Without having to go anywhere, EarthEye in effect, provides a downstream performance audit every 24 hours. Industry investigations have shown that 48% of hard disks and solid-state drives found in used computers sold online contain private residual data. And BAN’s own studies have shown that 40% of the tracked devices given over to electronics recyclers were sent offshore to developing countries rather than being recycled in the USA as claimed by the contracted recyclers. BAN’s tracking techniques have already led to federal indictments, convictions, and prosecutions for both fraud and environmental crimes, including by companies once used by many Fortune 500 companies. These include Diversified Recycling in Georgia, Executive Recycling in Colorado, Intercon Solutions in Illinois, and Total Reclaim in Washington. Because traditional audits, inspections and diligent compliance officers alone cannot always prevent bad actors from jeopardizing a company’s reputation and resources, BAN developed EarthEye to help organizations detect fraud or contractual violations after the auditors have gone home.